a cappella behind the scenes: 贏獎! Award! 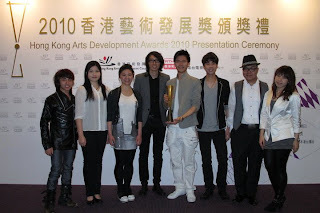 Congratulations to our parent organization, The Hong Kong Federation of Youth Groups, for receiving a Gold Award for Arts Education (Non-School Division) at the Hong Kong Arts Development Awards 2010 last night! This award recognizes the HKFYG’s work in promoting a cappella music in Hong Kong. HKMM was there to perform last night as well! 露天音樂會有相睇啦! 2011 Alfresco a cappella snapshots!